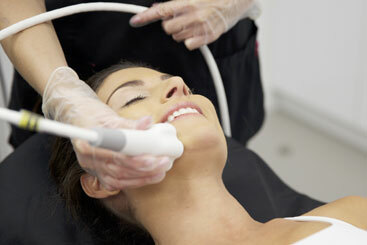 The TriBella photofacial treatment corrects discoloration, fades age spots, reduces sun damage, and improves skin tone. The photorejuvenation treatment utilizes intense pulsed light (IPL) technology to deliver direct bursts of energy onto targeted areas of skin. The intense pulsed light used is selectively absorbed by the target chromophores-namely, hemoglobin for vascular lesions, and melanin for pigmented lesions. The TriBella anti-aging treatment erases fine lines, reduces wrinkles, and firms up skin. The combination of Multi-Polar Radio Frequency (RF) and Pulsed Electro Magnetic Fields (PEMF) enhance collagen production to reduce skin laxity, erase fine lines, and fade the appearance of wrinkles. Multi-Polar RF produces fast and homogeneous heat in multiple tissue depths, resulting in superior clinical results and comfortable patient experiences.